• Advanced Bone Conductors – Bonebridge. If you put your fingers in your ears you cannot hear your friend anymore but you can still hear your own voice very well. This is because your own voice is transmitted as bone conduction vibrations through your skull bone directly to your inner ear. Bone conduction works without a functioning ear canal, ear drum or middle ear. A bone conductor is a device that picks up sound and transforms it into vibrations that are transmitted to the inner ear through bone conduction. Bone conduction type of hearing aids are primarily used to compensate for hearing losses located in the ear canal, ear drum or middle ear and these hearing losses are named conductive hearing losses. Conductive hearing losses are the most common type of hearing losses in children but adults may also suffer from conductive hearing losses. Hearing losses due to noise exposure or age are usually located in the inner ear (the cochlea) and are called sensorineural hearing losses and these are usually treated with regular air conduction hearing aids. In case of a complete inner ear deafness a cochlear implant is applicable. The ADHEAR adhesive bone conduction concept is a radically new type of non-surgical bone conductor. It is based on a small audio processor connected to an adhesive adapter attached to the skin behind the ear. The audio processor can be taken off without removing the adhesive adapter from the skin. The audio processor transforms sound into vibrations and transmits it via the adhesive directly to the skin and the skull bone to the inner ear through bone conduction. The device is worn without any pressure against the skin and does not require any bulky retention arrangements. It is therefore offering a comfortable and aesthetic solution. The new adhesive bone conductor is easy to use,reliable and has an excellent sound quality. The adhesive adapters, that have a unique composition and design to work well long-term with the skin, are disposable and are usually worn for 3 to 7 days before changing to a new one, and the adapters can also be worn while swimming or taking a shower. The adhesive bone conduction system is the first user friendly non-surgical bone conductor and it is suitable for conductive hearing losses with normal inner ear function. ADHEAR – Who Can Benefit and Where to Find It. ADHEAR is the ideal solution for children and adults with a conductive hearing loss, i.e. a loss caused by malfunction of the ear canal, ear drum or middle ear, but where the inner ear is still intact. The hearing loss may be present in both ears or in one of the ear. 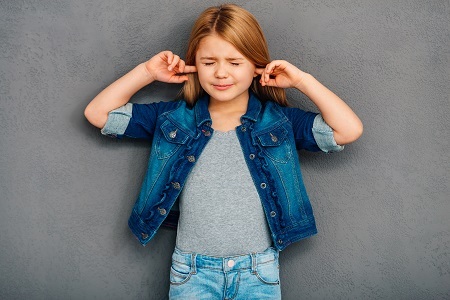 A hearing loss in only one ear is often underestimated, but is a significant handicap in many listening situations making it very hard to follow in both school and professional situations as well as for social life in noisy environments. ADHEAR requires a more or less normal inner ear function to offer good hearing. For patients with an inner ear hearing loss (sensorineural loss) which is usually caused by noise exposure or age, regular air conduction hearing aids or in some cases surgically implanted hearing devices are more suitable. 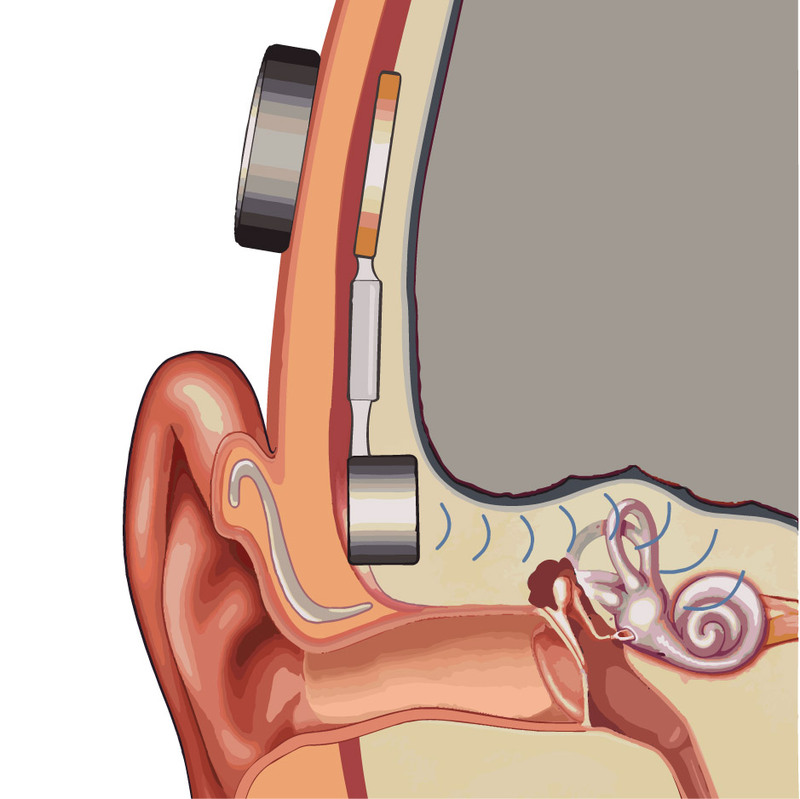 A surgically implanted bone conductor has a more powerful acoustic output compared to the ADHEAR, but for patients with a normal inner ear function, the ADHEAR is an excellent alternative that does not require surgery and is easy to use and comfortable to wear.ADHEAR is a product system of MED-EL Medical Electronics, Innsbruck, Austria. [Click here for more information at MED-EL’s website]. There has been a significant need for a well-functioning non-surgical bone conduction device for conductive hearing losses, especially for children. The drawbacks of existing headband, spectacle or softband bone conductors are well known to anyone experienced with conventional bone conductors. Poor wearing comfort due to the constant pressure and poor aesthetics from the required retention arrangements have been among the weaknesses. Numerous attempts have been done through history to find better and more acceptable solutions to the bone conduction design challenges. This far, only concepts requiring implant surgery have been able to address the drawbacks with conventional bone conductors. Implant surgery may however not be a suitable or acceptable alternative for everyone and ADHEAR may then be an excellent alternative. ADHEAR is the first user friendly non-surgical solution addressing a huge clinical need, especially in children. It represents a milestone and a breakthrough in this field. ADHEAR was invented by Patrik Westerkull and developed by Otorix, and is now a product of MED-EL. ADHEAR is a trademark of MED-EL. The principles of adhesive bone conduction were presented by Patrik Westerkull at the 5th International Congress on Bone Conduction Hearing and Related Technologies in Canada, May 2015, and at the same conference the clinical results were presented by Ann-Louise McDermott, Birmingham Children hospital, UK. The clinical results confirmed the clinical success of the adhesive bone conduction concept for patients with conductive hearing losses. Furthermore, audiometric data showing the performance of the adhesive bone conduction concept were also presented at the same conference by Dr Arjan Bosman, Radboud university hospital, Nijmegen, NL. During the development phase this project was named Adjoin, and this name was previously used to describe the adhesive bone conduction concept. The adhesive bone conduction system is now a product system of MED-EL Medical Electronics, Innsbruck, Austria and the product system is brought to the market under the name ADHEAR. The research and concept behind the adhesive bone conductor has also been presented by Patrik Westerkull during 2019 at for example the American Academy of Audiology congress, Ohio March 29 and at the 6th International Congress on Bone Conduction Hearing and Related Technologies, Nijmegen 2017. Clinical results have also been presented by leading clinicians around there is an ongoing work with scientific publications. 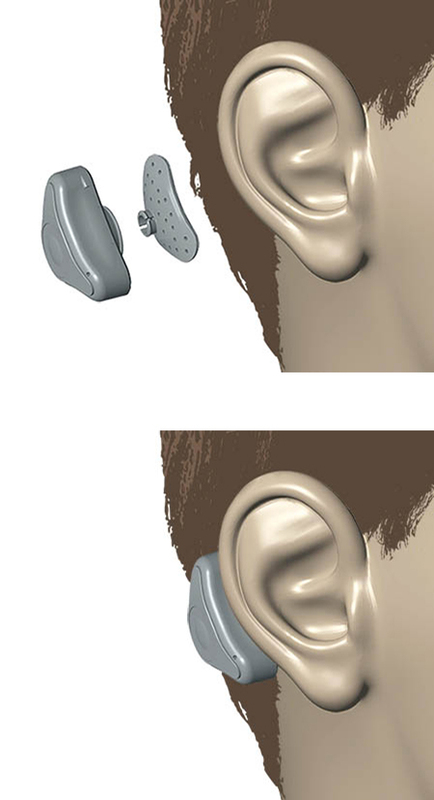 A bone anchored hearing aid is based on bone conduction audio processor that is connected to a skin penetrating attachment that is fixated in the skull bone with a small titanium implant behind the ear. The vibrations are transmitted from the audio processor directly to the skull without bypassing the skin offering a powerful sound quality also at higher frequencies. 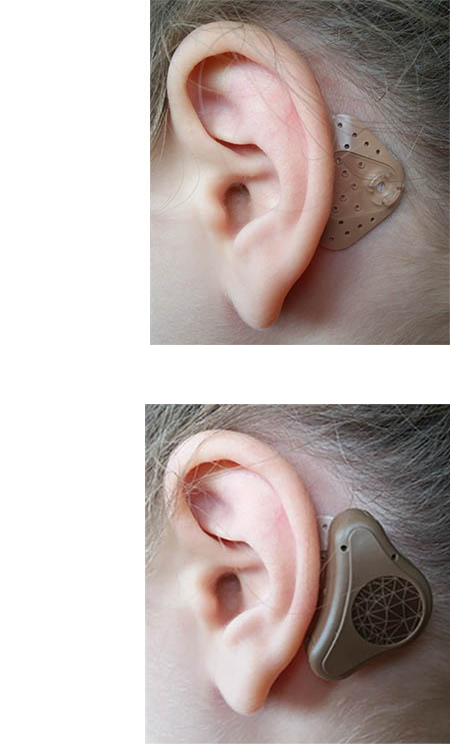 A bone anchored hearing aid is suitable for patients with conductive hearing losses and, especially for the more powerful versions, it does not necessarily require a normal inner ear function, so it may be used by those who have both a conductive hearing loss and on top of that also an inner ear hearing loss (a sensorineural loss). A bone anchored hearing aid can also be used to pick up sound on the deaf side for someone having a single sided deafness (SSD). A bone anchored hearing aid does not include any pressure against the skin and is comfortable to wear. The surgery is straight-forward although the permanent skin penetration requires a hygienic aftercare. Bone anchored hearing aids are offering valuable rehabilitation for hundreds of thousands of users. The required surgery, implant and hygienic aftercare may however not be suitable or acceptable for everyone in need for bone conduction rehabilitation. The development of the bone anchored hearing aid concept was enabled by the pioneer research of Prof P-I Brånemark and the first surgery was performed in 1977 at the Sahlgrenska University Hospital in Gothenburg, Sweden. Otorix has played a vital role in bone anchored hearing aid developments. Ponto System from Oticon Medical [Click here]. Baha System from Cochlear [Click here].